In ‘Prince Alexei Saltykov’s Journeys across India,’ the Russian prince effectively juxtaposes objective observations and personal impressions, facts and sentiments, both beautiful and wretched. Almost a century before the Roerichs made India their home, a Russian Prince—Alexei Saltykov— travelled through the country from 1841-43 and again from 1844-46, all the while documenting his experiences as artworks and notes. His journals published in French, and subsequently translated in Russian, became very popular. Prior to this, very little information about India was available in Russian, except for the journals of Afanasy Nikitin, a merchant from Tver who visited India in the 15th century. Greater interest about India developed in Russia only in the 19th century. “This body of work is interesting both from the artistic and historical points of view,” says Evgenia Petrova, Deputy Director for Science of the State Russian Museum (St. Petersburg,) “his drawings and letters, emotional and unbiased, became a valuable source of information for historians, art critics, scholars and thinkers,” a noteworthy instance being that of Karl Marx who quoted Saltykov in one of his articles about India written in the early 1850s. Over the years, Saltykov’s works had settled down to the rare book collections; until recently, when an English translation of his letters was released and 23 of his sketches and paintings made during his visits to India were put on exhibition at the Russian Centre of Science and Culture in New Delhi. The event was part of the celebrations marking the 65th anniversary of diplomatic relations between Russia and India. It is fitting to commemorate such an occasion by reviving the documents of an ex-foreign service man turned traveller and artist, who was received in India with warm hospitality and reciprocated with gratitude and compassion. "The day after our arrival in Lahore the King invited us to a hunt and based on its preparations it was possible to foresee that this diversion would be entertaining. Moving out we made up a front of fifty ceremonial elephants, covered in brocade saddlecloth; we were preceded and accompanied by a countless number of richly attired and armed riders on beautiful steeds. A whole regular battalion of Sikhs roared with drums and trumpets in order to rouse the game. The King took an active part: he shot quails very accurately; hundreds of poor birds were killed"
The book ‘Prince Alexei Saltykov's Journeys across India’ is a detailed commentary of India as Saltykov found it, about 170 years ago. He effectively juxtaposes objective observations and personal impressions, facts and sentiments, and beautiful and wretched. Since these journals were written as letters to his brother, the tone is conversational and spontaneous. His descriptions are picturesque and characters are multifaceted. He avoids stereotypical portrayals, save for a few generalisations. He observes royal and common folk with equal inquisitiveness and open-mindedness. In his imperial hosts he notices whimsical tendencies as well as religious tolerance and in his porters he sees deprivation as well as a strong sense of brotherhood, and weaves together vivid impressions with a sense of irony and even humour. While sharing anecdotes he is neither pompous nor dramatic, although at times quite romantic. For the benefit of his readers in Europe, Saltykov evokes associations to describe a land and people as foreign to them as India was at that time. He describes with awe a 4000 year old tower in a temple in Kancheepuram as even higher and wider than Moscow’s tallest tower, compares the military cantonment in Mumbai with Champ de Mars in Paris, and presents the Shalimar Garden as the Versailles of the Kings of Lahore. He matches the skilful manoeuvres of Indian sepoys with those of Russian Hussars and pictures a gathering of Sikhs waiting to meet the King as a choir of priests in The Magic Flute. 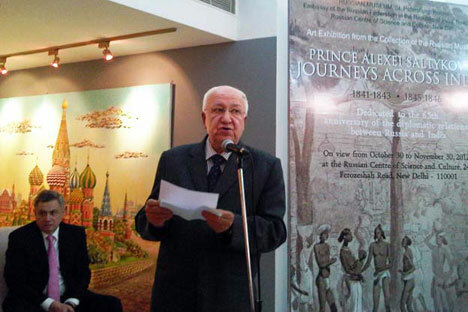 “In Saltykov’s ‘letters’, India is presented with its riddles and enigmas, attractions and aversions,” summarises Alexander Kadakin, Ambassador of Russia to India. “The artist’s sharp eye grasped the true beauty of the land where most foreigners saw only ‘barbarism’ or ‘hideousness’—in India’s countryside, towns and villages and most of all—in her people’s soul. Without any racial or religious prejudice, typical of the then European thought, he looked at India with open, keen and sympathetic eyes, trying not to pass judgements, but to understand and comprehend,” Kadakin says. As a matter of fact, whenever Saltykov did allude to acts of barbarism it was motivated only by a humanitarian sense. His could’ve been the first ever genuine attempt to see India beyond an antiquarian curiosity. Saltykov documented his impressions of the lands he visited and cultures he experienced, in text as well as pictures. Pencils and water colours accompanied him on all his voyages. He sketched common people—porters, mountaineers, and Akali warriors; painted scenes—hunting parties, religious processions, and pilgrim gatherings; rendered landmarks—Taj Mahal, Red Fort, and Jama Masjid. The ongoing exhibit of drawings and paintings taken from the collection of the State Russian Museum (St. Petersburg) is a fine example of Russian figurative art. Saltykov’s art reflects the influence of his tutor, Aleksander Orłowski, a Polish born painter who pioneered lithography in Russia. Orlowski tirelessly sketched from daily life and also portrayed elaborate war scenes. Saltykov’s works span both genres, from sketches of common people, at rest or involved in their daily routine, to paintings of highly-charged hunting parties or public pageants. Like all other honest drawings from life, these are chapters borrowed from an individual’s or a community’s personal history. His writings earned him the nickname “The Indian,” a title he must’ve been proud of, and might’ve even flaunted attires brought from India in the fashionable circuits of France. During his two journeys, Saltykov acquired a considerable collection of paintings, jewellery, clothing, armour and arms, besides memoirs. His treasures of written accounts are so immediate and infused with a personal touch that a reader might feel like being on an epic voyage with a Russian prince for company.